One of the easiest ways to stick to the gluten-free diet is to learn to cook your own gluten-free meals using common inexpensive ingredients that you can quickly assemble into a delicious meal. To help you out with that we’ve published some inexpensive, environmentally friendly electronic (ebook) cookbooks under the Easy Delicious Gluten-Free imprint. These cookbooks use the foods you already have in your refrigerator and pantry to help you put a satisfying, delicious gluten-free meal on the table in about 40 minutes. Many of our recipes are “one-pot” meals with minimal cleanup required so you can spend more time doing the things you want and less time cleaning the kitchen. Our cookbooks are designed with extra instructions so that even beginner cooks and older children can successfully cook each recipe. Each recipe has been tested to maximize flavor and minimize preparation time through the use of select “gluten-safe” processed foods for convenience. Time spent measuring ingredients has been minimized by designing the recipes to use entire package volume when possible so there’s no waste and no half-full ingredient containers in your refrigerator. We understand that the last thing you need when you are learning to cook gluten-free is to spend a lot of money and time shopping for exotic, costly ingredients. Many of the low-cost ingredients used in these recipes are already in your pantry or refrigerator. There’s no need to go out and buy radicchio, lobster, or crème fraiche – we promise. Easy Delicious Gluten-Free cookbooks are available on Amazon Kindle for download to your Kindle device. Our electronic cookbooks are also viewable on Apple devices (Mac, iPad, iPhone, iPod Touch), Android or Samsung (phones, tablets), or Windows-equipped PC when using the Kindle Reader App. 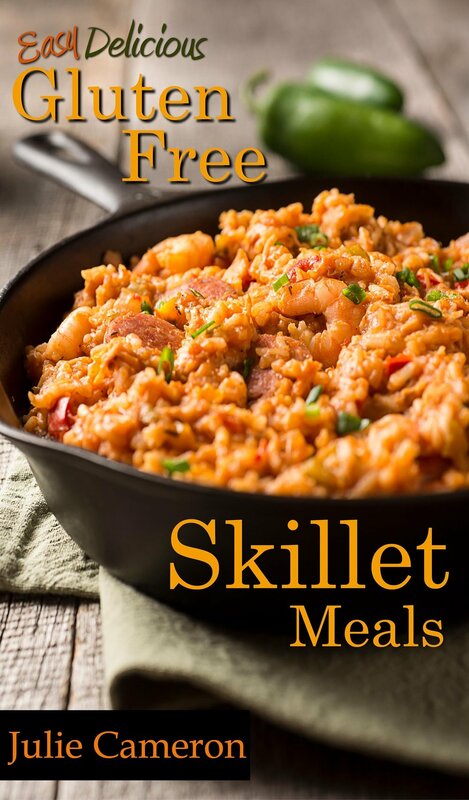 Easy Delicious Gluten-Free Skillet Meals features a month’s worth of easy to prepare one-pot skillet meal recipes that use beef, chicken, pork, and canned fish (tuna, salmon). There’s even vegetarian recipes for those on the vegetarian diet and several casein-free recipes that contain no dairy products for those who are managing autism through diet modification. These one-pot recipes use ordinary ingredients you already have in your refrigerator and pantry to make an extraordinarily delicious one-pot gluten-free meal that can be prepared in about 40 minutes. Complete with bonus sections on shopping gluten-free and reducing cross-contamination with gluten-containing foods in your kitchen Easy Delicious Gluten-Free Skillet Meals is an informative primer on learning to cook gluten-free the easy way. If you want to sample our recipes for less than a cup of coffee - just 99¢ - then try Easy Delicious Gluten-Free Hamburger Skillets. This cookbook sampler features a week’s worth of the best pasta and hamburger recipes from our Easy Delicious Gluten-Free Skillet Meals cookbook. Enjoy easy to prepare, one-pot gluten-free pasta and hamburger skillets similar to those popular boxed dinners that use Hamburger and are a Helper for busy cooks. Easy Delicious Gluten-Free Soups, Stews, and Chowders features 50 easy to prepare one-pot recipes including Easy Vegetable Beef Soup, Classic Chicken Noodle Soup, Mexican Pork Chili Verde Stew, New England Clam Chowder, Shrimp & Rice Gumbo, Easy Ratatouille, Classic Beef Chili, Summertime Gazpacho, Chicken & Rice Soup, Hearty Minestrone Soup, Herbed Tomato Soup, and many others.